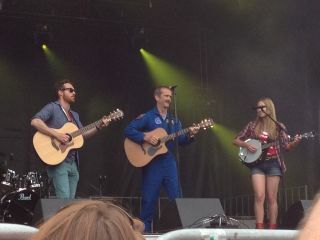 Canadian astronaut Chris Hadfield performs with the Trent Severn folk trio on Canada Day (July 1) in Ottawa. OTTAWA — Pausing before thousands of fans in a downtown park, Canadian astronaut Chris Hadfield gave serious thought to a silly submitted question: What are the benefits and drawbacks of having a mustache? Those attending the Canada Day festivities on Monday (July 1) — some wearing fake Hadfield-inspired mustaches themselves — laughed as Chris Hadfield explained one advantage of facial hair: A mustache is great for hanging on to extra soup, and also for impressing his wife, Helene, Hadfield said. Then, Hadfield described mustache negatives to the crowd, which was celebrating Canada's national holiday in the capital city of Ottawa. After five months in space, Hadfield returned to Earth in late May and is progressing well in his recovery from microgravity. On the station, Hadfield played David Bowie's "Space Oddity," chatted with "Star Trek"'s William Shatner and wowed the world with his amazing space photos — all while running the most productive science mission to date. The Canada Day event, however, was one of the last for Hadfield as an astronaut. After 21 years with the Canadian Space Agency (CSA) and 35 years in the government in civilian and military roles, Hadfield is retiring today (July 3) from his extraterrestrial endeavors, and will focus on something new. The Snowbirds Demonstration Team (431 Squadron) flies above Ottawa's Parliament Hill as part of Canada Day festivities. In the near future, Hadfield plans to tour schools and do some paid public speaking. Media reports indicated that through the company Speakers' Spotlight, Hadfield received more than 500 emails in the last week of June alone requesting that he speak at corporate events. Beyond that, Hadfield said, his agenda is very open. Among Hadfield's projects will be a new book. Random House Canada will publish "An Astronaut's Guide To Life On Earth" on Oct. 29, the publishing house announced Tuesday (July 2). In a release, Random House officials said Hadfield had inspired the world. One of the many people inspired by Hadfield was Adam Harris, a teenager who followed Hadfield since childhood. Harris, who was here among the crowd on Monday, was six years old when Hadfield made a headline-setting flight in 2001 as the first Canadian to do a spacewalk. The boy watched from home, and was determined to fly into space himself someday. Adam Harris, a teenager who has been inspired by Chris Hadfield for more than a dozen years. Shortly afterward, Harris tried to meet Hadfield in person at an event at the CSA's headquarters in Longueuil, Quebec, but missed the astronaut by just minutes. Later, Harris wrote to the astronaut and received an autographed picture. "Study hard," Hadfield wrote along with his signature. Harris took the advice to heart: He received a 92 overall average last year in CEGEP, a post-secondary collegiate program for Quebec students. "I pinned [the autograph] to my dresser, and every day, I woke up and I looked at it," Harris told SPACE.com. Harris added that although his interests now trend toward criminology, he did enjoy his three years as a Royal Canadian Air Cadet, the same role that gave Hadfield his career start. "The one thing that makes everyone mad in the astronaut corps is, there is nothing [Hadfield] does that he isn't good at," Marshburn said. In addition to answering questions from the audience, Hadfield pulled out his guitar to reprise David Bowie's "Space Oddity," which Hadfield performed on the space station. Accompanying Hadfield on stage was Trent Severn, a folk trio from Hadfield's hometown of Stratford, Ontario. Earlier in the day, Hadfield showcased his musical talent on a larger stage at Parliament Hill, the site of Canada's federal government. An estimated 80,000 people watched as the astronaut sang "I.S.S. (Is Somebody Singing)," a song that debuted as a space-Earth duet. Against a lineup of well-known Canadian singers — Metric and Carly Rae Jepsen were among the headliners — Hadfield got some of the loudest cheers from the crowd. Canadian astronaut Chris Hadfield performs on Ottawa's Parliament Hill. At the festivities, Hadfield fans could also browse a temporary outdoor exhibit of pictures he took from orbit, or eat a "Back to Earth" barbecue chicken sandwich based on a recipe created by the Hadfield family. The meal, offered for sale on Canada Day by the Chicken Farmers of Canada (CFC), came about through negotiations between the National Capital Commission (a federally owned entity that hosts Canada Day in Ottawa) and the CSA. Hadfield comes from a farming family, and his wife Helene is a chef, said CFC spokeswoman Lisa Bishop-Spencer. The CFC has been a sponsor of Canada Day in Ottawa for 21 years, and was glad to get a boost from Hadfield's social media skills for this year's event. "It's been a mission for us to connect with consumers with the channels they use," Bishop-Spencer told SPACE.com. Hadfield's next public appearance is as parade marshal of the Calgary Stampede, which opens July 5.